There are so many different kinds of occasions to bring hostess gifts. In keeping with the season, I thought it would be fun to get into the different summer-time fun ideas that I know I have (or would like to plan for) on my calendar these next few months. Couple of things to be aware of, unless I am specifically asked to bring a dish or contribute to the meal, I try not to bring a gift my host feels compelled to serve. Why? It’s awkward if it clashes and I assume he or she has spent a good amount of time planning and coordinating everything to be “just so” and I don’t want anyone to feel obligated to change that on my accord. Also, a gift is meant to be something for the recipient to enjoy on their timetable. That said, I do like things to feel thematic, whenever possible. Picnic: If you know your hosts well and they are picnicking in their own garden or backyard, a potted plant or a plant kit like Forget-Me-Nots or Hydrangeas are nice and less laborious if everything comes in one box or is already potted (or they can decide not to plant at all). Don’t do bulbs, seeds or the like unless you know they love these things and know what to do with them. If you want to keep with a picnic theme, you could always bring muffins or bagels–stuff for breakfast the next day when they will likely NOT want to cook–in a little basket. Beachy-Gathering: A fun beach bag–think straw like this one from Anthropologie ($29.95) or some other woven material–or a plush beach towel like the one shown right from Frontgate ($39.50) is always a nice gift, especially for the regular beach dwellers. If kids are involved throw in some sand toys and they may erect a statue in your honor should they need to call in reinforcements at some point. Warm-Weather Dinner Party: I like these ice molds for wine ($26.99, Amazon.com), they require much more time than a host could allot so there’s no pressure to do it now, but are great to keep bottles cold for a future soirée. 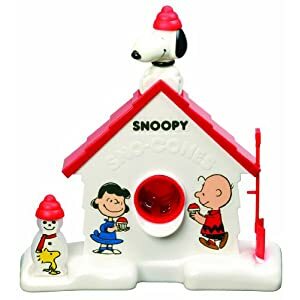 For a more whimsical gift, especially one with kids in the house, I love, love, love the Snoopy Snow Cone Maker ($39.99, Amazon.com). It can be hard to find though, so plan well in advance. Outdoor Barbecue: The inclination is to bring sauces and rubs, but again, that might clash with the menu. If you know your hosts and they will want to have an assortment, I think it’s better to ask in advance. What could be cool though is a fun shatter-proof tray that is light or even a smart looking apron tied in a bow. Williams Sonoma has this one that can be personalized ($19.95) or this striped one ($29.95) that is also very nice looking.